Contact us for all of your private function needs. 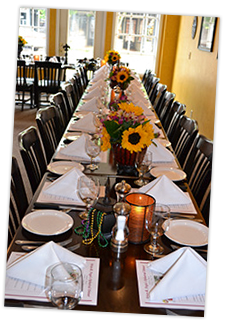 We specialize in Pharmaceutical Lunches, Dinners, Business Meetings,and Birthday Parties. We have a private room that we call the “Quarter” that comes equipped with a 100″ projection screen. It comfortably seats up to 50+ people. We would be glad to show it to you anytime.